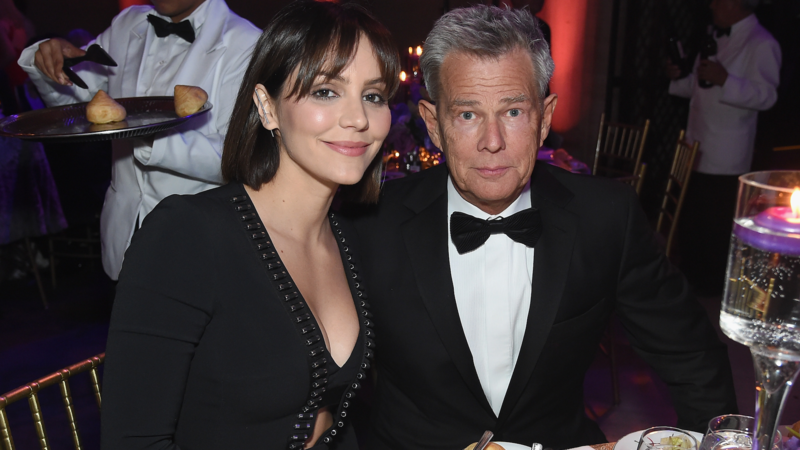 They may not be husband and wife just yet, but David Foster and Katharine McPhee already have the sweet newlyweds vibe nailed. On Monday, the pair took to Instagram to gush about each other — and, well, it proved pretty darn cute. It all started when McPhee posted a note to Foster in her Instagram story. She’s currently in London starring in a production of Waitress, but she wanted to let her fiancé know he was at least with her in spirit. “Far away from each other but still can’t wait to marry you @davidfoster,” she wrote, sharing a photo of herself laying against her arm with her engagement ring on full display. All jokes aside, though, McPhee and Foster clearly can’t wait to walk down the aisle. On January 15, she spent the day trying on wedding dresses with Jordan Foster, another one of Foster’s daughters. “Wedding dress fittings today with @jordiefos! It was such a happy day. (It’s not the dress, but just wanted to share),” McPhee wrote. As of yet, McPhee and Foster haven’t revealed a wedding date (although their back-and-forth Instagram banter would seem to imply one could be nearing). This will be the second marriage for McPhee, who was married to Nick Cokas for six years before legally filing for divorce. It will be the fifth marriage for Foster, whose divorce from Hadid finalized in 2017.